Brushing aside jokes about intoxicated livestock, Alberta farmers are growing industrial hemp, a crop that has become more profitable than canola and other conventional products. Hemp is one of the oldest cultivated crops in the world. Unlike marijuana, which has a THC content of five to 10 per cent, the THC level in hemp is 0.3 per cent. meaning it is impossible to get high from the product. A growing number of farmers are becoming interested in the profitability of this legal crop. Compared to canola which sells for about 18 cents a pound, hemp currently fetches 80 cents a pound on the market. All parts of the plant can be harvested and used in food, textiles and building materials. Although there is a strong business case for hemp, Brian Rozmahel, a farmer near Viking, Alta., received a lot of ribbing in the local coffee shop when his neighbours learned about his plans. “Oh my cows will all be high and there was a lot of good-natured poking at me but also they certainly paid attention because it’s a great break in a rotation for even a conventional farmer,” he said. Rozmahel planted 70 acres of hemp this season, his first year growing the crop. He plans to triple that amount next year. Stories like that have other producers taking a serious look at hemp. Ryley-area farmer Brian Lyons has run the numbers and likes the potential. 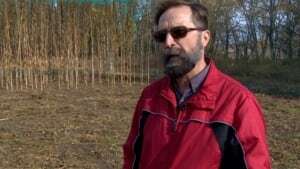 “Up to $700 an acre, which is one and a half times what canola would be and three or four times what coarse grains would be,” he said. However, the stigma of hemp is hard to erase. Although 67,000 acres were farmed in Canada last year, the federal government requires producers take a number of steps before they plant the first seeds. Prospective growers need to get a licence from Health Canada and undergo a criminal record check. Each year, seed samples from each farm must undergo analysis to ensure the THC levels aren’t increasing. Jan Slaski, a scientist with Alberta Innovates, a corporation partly funded by the Alberta government, is pushing Ottawa to relax some of these requirements. “We want hemp to be grown and perceived by the regulators, by the general public, by media as any other crop like canola, like barley, like our staple crops,” he said. Alberta Innovates Technology Futures is growing industrial hemp on a test plot near Vegreville. The plant is a tall stalk, about three metres tall with a large head of seeds on top. Growth of the product is rocketing. A decade ago, 15,000 acres of hemp was grown in Canada. Last year, 67,000 acres was farmed, with 90,000 projected in 2014. About a third of the crop is grown in Alberta. The largest Canadian producer grows 8,000 acres of organic hemp near Taber, Alta. Although Alberta farmers are growing hemp in large quantities, the province doesn’t have a facility to process the seeds and stalks. Some farmers are shipping their hemp to a processor in Manitoba. Others, like Rozmahel, are putting their crop in storage until processing moves closer to home. “I’m going to store it until such a time — it stores really well — I can use it for cattle bedding if there is no market for it or I can wait until such a time that there is a market,” he said. Rozmahel may not have to wait too long. There’s word that details about an industrial hemp processing plant in southern Alberta may soon be announced.